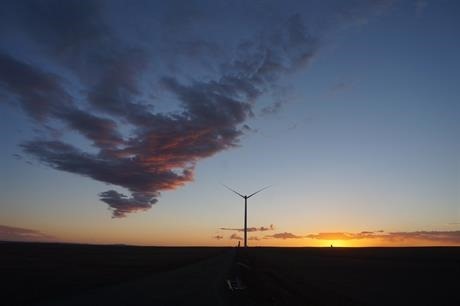 The farm, consisting of 25 Vestas V90 turbines, was finished three months ahead of the scheduled commencement in December 2017. 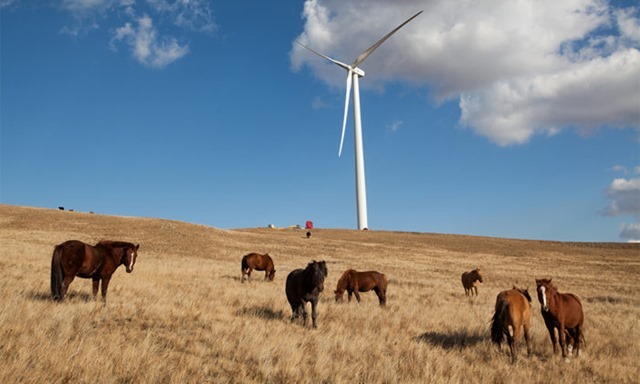 SoftBank Group chairman and chief executive Masayoshi Son said, “I’m very pleased that the commercial launch of the Tsetsii wind farm marks the first step for SoftBank Group to establish a renewable energy business in Mongolia under the Asia Super Grid project, in addition to India and Japan.”- the UB Post reported. Earlier this year a first 10MW solar farm was launched ahead of schedule in Darkhan and another 50 MW wind project in Sainshand secured full funding an is likely to come into operation in 2018. Plans of development till 2020 announced by the Ministry of Energy in May 2017 ( See Slide below) are likely to be adjusted in favor of true renewable energy. 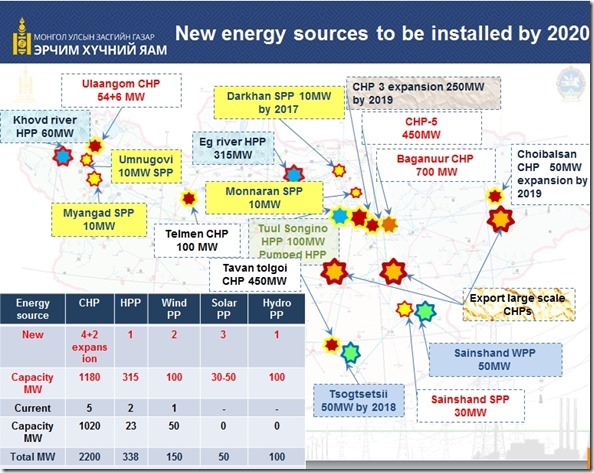 In its 2015 Energy Policy and the NDCs under Paris Agreement Mongolia committed to increase share of non-fossil sources of energy to 20% by 2020 and to 30% by 2030. According to our own estimates in October 2017 Mongolia’s electricity generation capacity consists of 1020 MW coal-fired plants, 28 MW hydropower, at least 15 MW solar, 105 MW wind farms and about 25 MW of diesel and other small-scale facilities. Therefore wind and solar already contribute 10% of total electricity generation capacity, while hydropower barely contributes 2%. And the reasons for such difference are crystal clear. As anticipated, all major hydropower projects announced during last decade (e.g. Egiin Gol, Shuren on Selenge River, Orkhon, Erdeneburen on Khovd River) have been stalled\delayed due to lack of finance, low technical capacity, environmental and social concerns, non-compliance with international conventions and disputes with neighboring countries. Some of projects, like Egiin Gol Hydro, were also investigated for corruption and inefficient spending. These are common problems of hydropower sector in developing world. None of Mongolian large dams is going to be completed (and likely even start construction) before 2020 deadline. If the Government of Mongolia is serious about doubling the share of non-fossil generation capacity by 2020 it can achieve it only by accelerated construction of wind and solar farms, probably, supporting it with pumped storage for maneuvering capacity and radical improvements in grid management.